This week I have been finally facing up to the “C” word, and acknowledging that Christmas is fast approaching. Gulp. I’ve also zig-zagged back and forth to London, beamed with pride at my son’s rendition of Samuel Pepys in a school play, and traipsed more than 8 miles in a day on the school run, shopping and shepherding my daughter to Cubs. Roll on the weekend, I say. And, without further ado, here’s my round up of this week’s five frugal things. Stash to stuff stockings. NB Father Christmas uses very stretchy socks. In our house, Father Christmas sometimes needs a little assistance when it comes to stuffing stockings. Much as I love Christmas stockings, the contents can easily cost an arm and a leg, rather than a mere sockful. When I was traipsing round Hadleigh on a desperate hunt for Pudsey ears (theme days at school have a lot to answer for), I did at least spot a bunch of stocking presents. 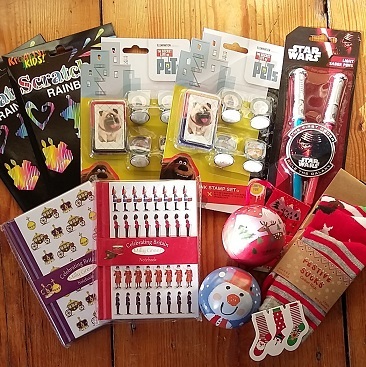 I’ll split the £3 pack of Star Wars light sabre pens and £1.49 Christmas socks between two children, but otherwise everything else cost under a pound a pop from QD Stores*. As you’ll see, I’m keen on stuff that might keep overexcited children occupied for extra moments on Christmas morning. Check out the fun wooden retro toys like dominoes, Ludo, pick up sticks and 3D dinosaur puzzles, all for under £1.25, in the pocket money toys section on their website*. If you need any inspiration for cheap and cheerful stocking fillers, here’s a link to an article I wrote for Mirror Online last year. I also found Terry’s dark chocolate oranges for a mere £1.49 in QD. For some reason, you can usually find the milk chocolate version on offer for £1, but the dark chocolate ones can be rarer than hens’ teeth and much more expensive. £1.95 I paid last year! (Sometimes that OCD spending diary spreadsheet comes in handy). One other Christmas purchase was a fetching couple of Christmas mugs ordered online. I spotted an offer in the weekly newsletter from MoneySavingExpert (if you aren’t one of the millions of people who get it, it’s worth signing up for assorted financial snippets). 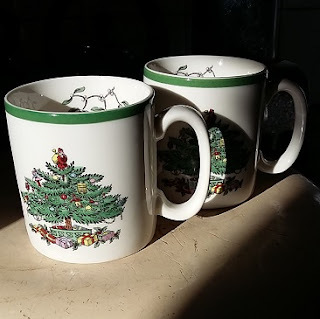 I paid £7.99 including postage for a couple of Spode mugs in the 1930s Christmas Tree design, which normally sell for around £13 each. Best I can see elsewhere at the moment is £5.20 each plus P&P. I’m hoping they’ll go down well with the children on Christmas morning and be used for many years to come. Now, I’ll fess up right immediately that I suspect I’ve left this one too a bit late. One idea I had for a nice but money-saving Christmas present was to plant bulbs in pots decorated by the children. Thought it might work as a present for assorted teachers and teaching assistants fed up with yet more chocs, biscuits and bath stuff. While I was in QD I looked for the earliest flowering bulbs, which turned out to be hyacinths. Apparently if planted by end September (cough) they should flower by mid December. 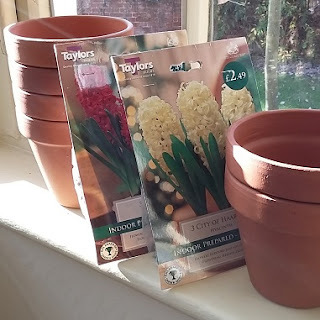 I got six bulbs for £4.98 and six clay pots for 80p each, which combined with spray paint, stencils and compost we already have, comes in at just over £1.60 a present. This year, any recipients may end up staring at a green stumpy thing poking up from some earth, but maybe this post will remind me to start earlier next year! In the mean time I will go and dig out my copy of The Diary of a Provincial Lady just to remind myself how badly indoor bulbs can go wrong. On my way back from all that shopping, I ended up racing a rubbish van to our door. 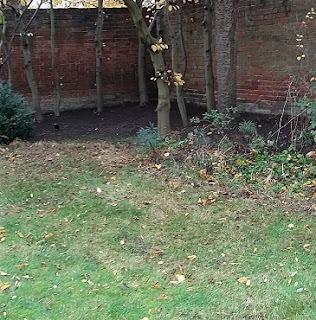 The local council charges £40 a year to collect a wheelie bin full of garden waste every fortnight. Well worth the money, I reckon, to cut down on trips to the tip. 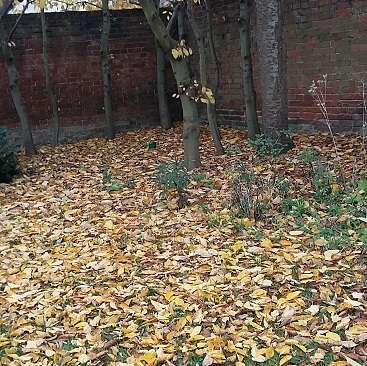 It also inspired me to rake up more leaves from the lawn, so we’re all set for the next collection too. 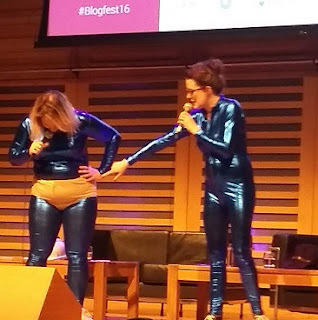 Last weekend, I ended up making a lighting dash down to London for Mumsnet Blogfest 2016. I’d been havering back and forth about whether to go and feeling plenty of parental guilt about abandoning my husband and children on a Saturday. In the end, I think it was finding a 15% off voucher code the night before that finally swung it, so my frugal point is always to do a quick Google for discount codes. My network railcard also helps with getting a third off off-peak train travel. Attempting to claw back the ticket price by eating my bodyweight in breakfast pastries was perhaps not my best plan, but it was an inspiring and informative day. I might even get some work out of it! I’m guessing not many people reading this are bloggers who’d be fascinated by a blow-by-blow account of the day, so I won’t bang on about it, but do say in the comments if you’d like to hear more. Over to you: any frugal successes to celebrate? Are your Christmas presents all done and dusted, or are you still hunting high and low? I’d love to know. Lovely choices! I find that the stocking items get harder as the kids get older. My boys are 9 &10, and my nephews (we share stocking filling between myself, my mom & my sister) are even harder at 11 and 13. We discussed getting rid of them next year, but we'll have to see how the kids respond. This year we agreed to reduce the number of items, which frees us up to spend slightly more for the two items we each put in. Good luck with any stocking discussions, Hawaii Planner. My mother was still doing stockings for my sister and me well after we'd left home! Mammoth Christmas shop done today. Only a couple more bits to buy. I like to get the buying done early and promise myself I will wrap as I go but I never do. Then I end up panicking on Christmas Eve. Actually, writing that has made me determined to start the wrapping. Wow good for you in getting most of your Christmas shopping done. I have so much left to do! I love a voucher code! Great ideas about splitting things for x,mas stockings too.